Today’s homes and buildings have many doorways with various types of door knobs and decorative and functional door hardware. You pass through many doors each day of various styles. 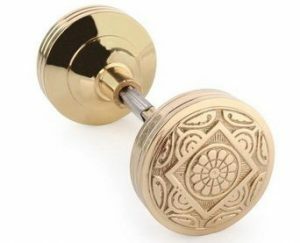 The history of doors and door knobs is an interesting study and I was curious as to exactly when door knobs were invented. Early doorways were covered with animal hides or other materials and were left uncovered during the day for ventilation. Wooden doors with crude pin and tumble style lock mechanism have been traced back to 3000 B.C. in ancient Egypt. Doors were also used by the ancient Babylonians. Excavations in Greece and Rome have uncovered hinges on doors that are very similar to hinges used today. In the 1500’s doors hung from strap hinges by bolts attached to the stonework. There were no real door knobs but the door was opened with a leather strap, and locking was done by means of a large beam placed across the door. In the early American colonies, wooden doors with wooden latches were popular. The 1800’s saw a boom in door knob design. According Encyclopedia.com, “from 1830-1873, there were 100 U.S. patents granted for knobs.” Decorative door hardware, including round knobs, were introduced at the Centennial Exposition of 1876. The earliest patent for a double-acting pin tumbler lock was granted to American physician Abraham O. Stansbury in England in 1805. An improved version, still in use today, was invented by American Linus Yale, Sr. in 1848. Osbourn Dorsey, an African American inventor submitted a patent for improvements on a door-closing devise and the first door stopper in 1878. Pressed glass knobs were popular from 1826 to 1850. Cut glass knobs were popular until around 1910. Cast metal knobs were introduced in 1846. China and ceramic knobs were imported from Europe and popular from the mid-1800’s until the early 1900’s. This includes porcelain knobs that are still popular choices for home restoration. Glass and porcelain knobs were popular during the Depression as it was a cheaper material, and also during World War II when metal was being conserved for the war effort. The spindle knob was first introduced in the late 1800’s. 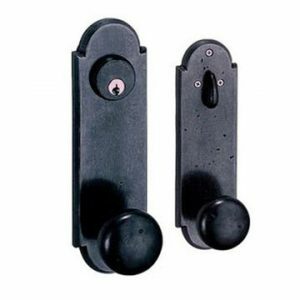 A major improvement in door knobs occurred around 1900 when the first knobs with ball bearings were introduced. Today, knobs are made from many materials with brass being the most popular. Forged brass has replaced cast brass as the preferred method as it much stronger than cast brass. Forging involves heating metal to 1400 degrees Fahrenheit and forcing the heated metal into a die under high pressure. Whether you want to update your entry door set or want a vintage knob set for an interior door, Van Dyke’s Restorers has over 2,000 door hardware items for any style home. Choose from round or rectangular back plates in rope design, Victorian, Prairie, Art Deco, Egg and Dart, and more styles. Add a sparkling crystal knob in several styles or a depression era colored glass knob. 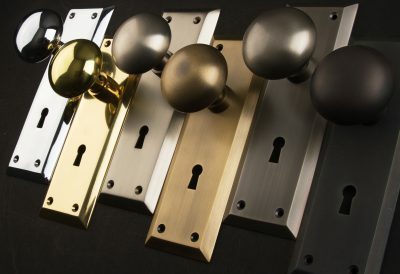 From stunning Victorian designs to simple New York or Mission style knob, you will find the perfect knob from some of the industry’s finest door hardware companies including Acorn, Grandeur, Nostalgic Warehouse, Brass Accents, and more.